If you’ve already bought our 100% cornstarch compostable & biodegradable coffee capsules then our tips & tricks blog post is a must read to get the most from your Nespresso machine & our compostable and biodegradable capsules. Our FAQ section also includes troubleshooting advice, where a good clean and a couple of tricks are usually all that’s needed to ensure a smooth, indulgent coffee cup after cup! Or you can email us with specific enquiries. Still making up your mind? Yikes! 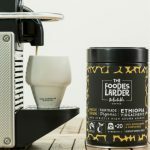 Our Ethiopian Yirgacheffe and Peruvian eco-coffee capsules have been so popular that they’re out of stock. But fear not, they will they be back shortly and will look and taste even better! Yep, we’re on the cusp of launching our all-new, exceptional coffee line up in compostable coffee capsules that don’t cost the Earth. Sign up via our home page form to be the first to see and try them. 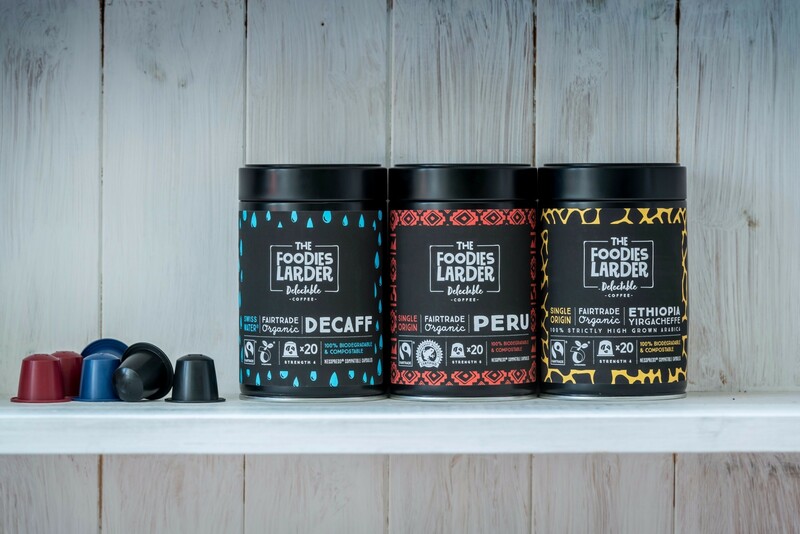 If you are still deciding though, then our Foodies Larder range of three premium compostable coffee capsules are compatible with Nespresso®️ home systems, giving you a truly delicious, ethical Nespresso coffee experience every cup. This is thanks to the rich, Single Origin, Organic and Fairtrade® coffee we source from our coffee cooperatives in the Ethiopian Yirgacheffe region and the mountains of Peru. Both are shade grown and our Peruvian coffee is also Rainforest Alliance certified, so you can rest assured our coffees are grown at source with the least environmental impact possible. The good news doesn’t stop there though, especially for Decaff lovers who can now enjoy the UK’s very first compostable, Organic Swiss Water® Decaff coffee capsule. Using an all-natural and 100% chemical-free process to extract the caffeine from the beans. Good for you and good for the planet! 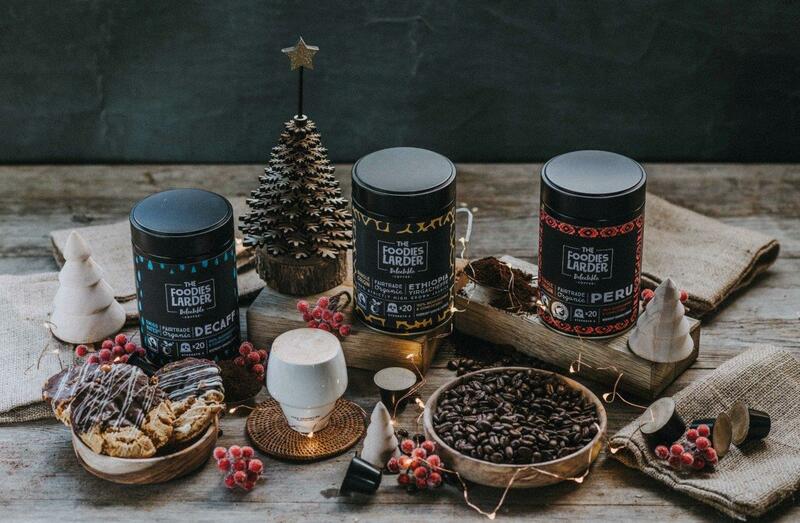 Each of our coffee capsules also contain 10% more coffee than a standard Nespresso® capsule, giving you even more reason to make the switch to our 100% compostable and biodegradable coffee capsules. They really are coffee capsules that don’t cost the earth! We’re also particularly proud to say that our Nespresso® compatible capsules are 100% compostable and biodegradable, unlike Nespresso’s® own capsules and all those plastic coffee capsules available online or in supermarkets. After use, simply put our coffee capsules into your local council food waste bin at home, safe in the knowledge that our capsules will have broken down within 6-12 weeks! 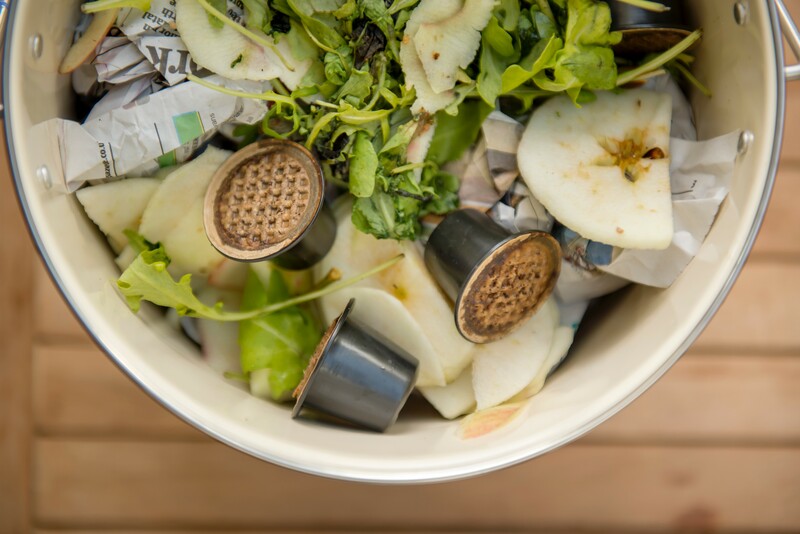 You can also add your used capsules to your home compost pile, if you have one. Conditions do vary greatly from one compost pile to another though, so it is hard to put an exact time frame on things, so please allow 18 to 24 months to decompose naturally where the ideal temperature in healthy compost piles need to be around 20° to 40°. Even so, it will disintegrate and improve your compost when it does, so it’s a win-win! We’d of course always encourage you not to add to landfill, but the incredibly diverse (bonkers!) recycling requirements between UK councils means you might not have these options. In which case you can put your used capsules into your standard rubbish bin as our capsules are also biodegradable – in fact they are one of the only eco-capsules to be 100% bio based with no petro-chemical content whatsoever (not all are, sadly, despite their compostable claims!). The above is in stark contrast to aluminium Nespresso® capsules, which can take up to 150 years to breakdown, or up to 500 years for plastic capsules which are not recyclable! Nespresso® offer their own capsule recycling bags and service of course, but in reality, the majority of capsules are simply thrown away and end up in landfill sites. So ultimately Nespresso’s focus on coffee convenience is sadly at odds with the inconvenience of their recycling process. Likewise, some companies selling plastic coffee capsules make spurious claims about being ‘eco-friendly’. But the only way they can achieve this claim is in fact by putting the onus solely on you, the customer, to do all the work. So if you are one of the few people to have both the conscience and time to painstakingly peel-empty-wash every single capsule before placing it into the recycling bin then we salute you! Thankfully though, technology has helped us develop a biodegradable coffee capsule range that helps you avoid that guilty feeling of throwing capsules in the bin or the burden of recycling coffee pods via Nespresso’s recycling scheme. So join us and indulge in a guilt-free coffee courtesy of our lovely cooperative farmers and our biodegradable coffee capsule varieties here! Our Strictly High Grown organic and Fairtrade® Ethiopian coffee is slow grown at altitude, giving it a complex, sweet and intensely refreshing flavour. 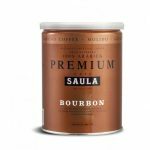 The result is a fragrant coffee with a light to medium body and a hint of spice & rich fruit, with a lovely chocolatey finish. 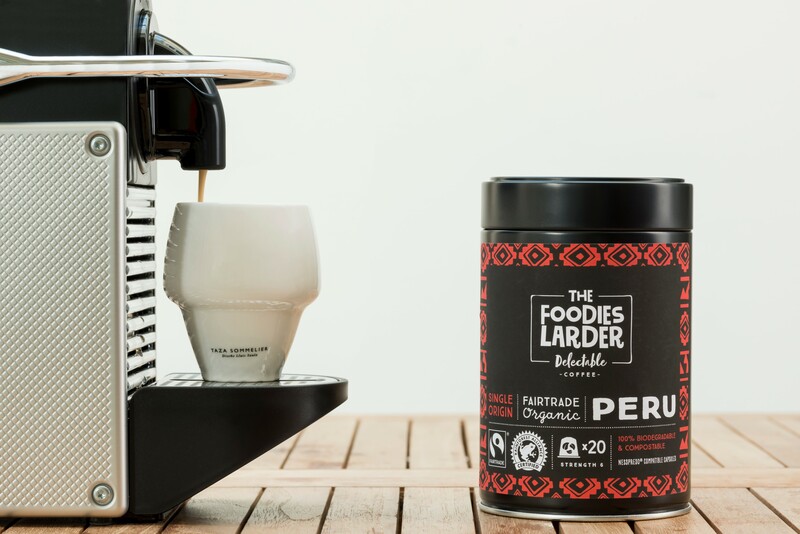 Our Organic, Fairtrade® & Rainforest Alliance® certified Peruvian coffee has a fruity acidity and smooth syrupy sweetness, thanks to the unique environment and growing process used by our smallholder farmers. We’re confident you’ll love its smooth, full-bodied cocoa flavour and toasted hazelnut aroma! 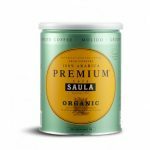 Our speciality, organic and 100% chemical free decaffeinated coffee capsules offer a smooth, medium bodied blend with mild acidity. The roasted peanut and cookie dough notes end with a soft-milk chocolate kick…delicious and created without using the same chemicals as those used in paint stripper (80% of decafs on the market do, which is particularly worrying)! 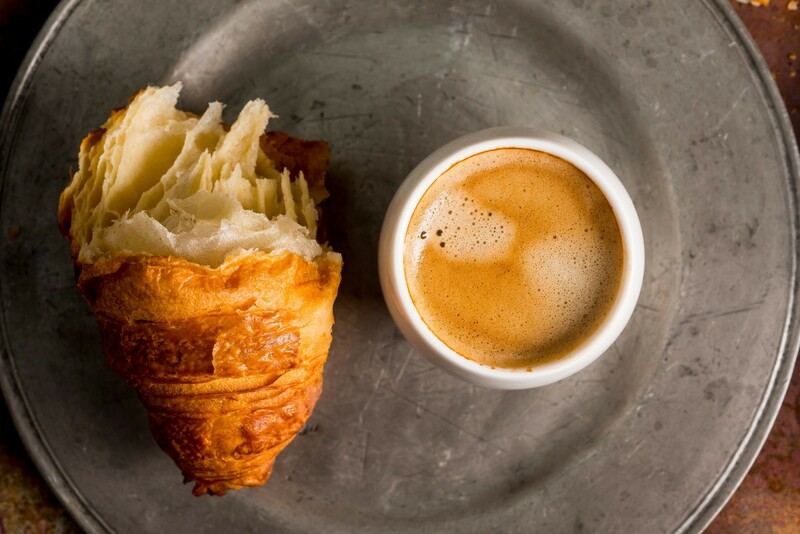 We’ve made it our business to source fabulous coffee from around the world. 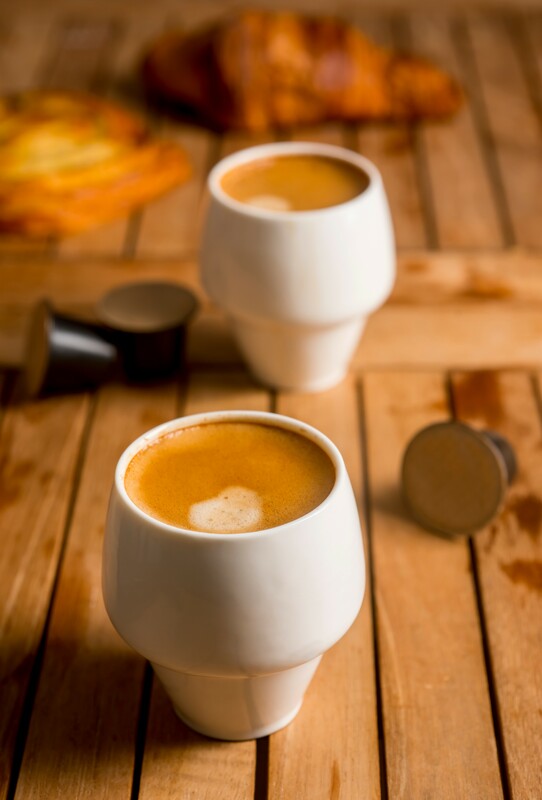 Our commitment to environmentally and socially sustainable practices is reflected in our range of biodegradable & compostable cornstarch coffee capsules for Nespresso® machines. 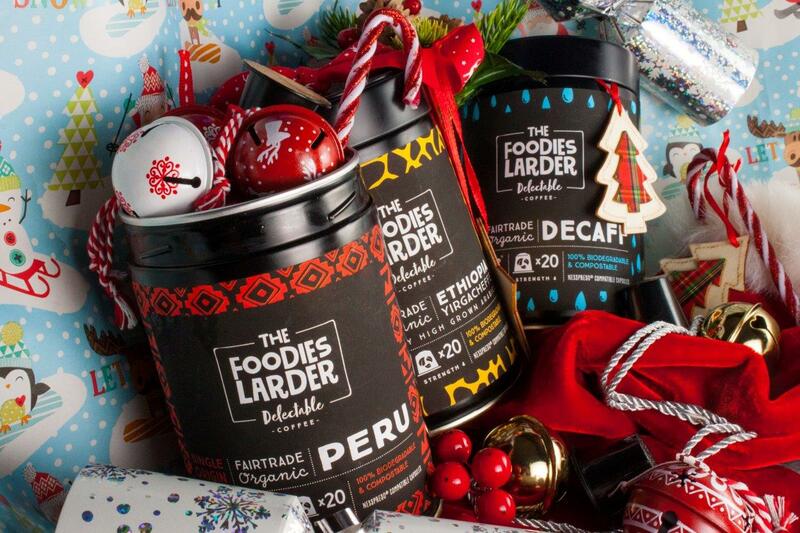 Filled with single origin, Organic, Fairtrade, Rainforest Alliance and Swiss Water® Decaffeinated Arabica coffees, they’re the ultimate in eco-coffee convenience, disintegrating within 150 days…not 150 or 500 years like Alu and plastic capsules! Cookies help us give you the smoothest experience on our website so scroll on and enjoy (or amend your preferences here). These cookies are essential to enable you to use the website effectively, such as when buying a product and / or service and saving your cookie preferences themselves and therefore cannot be turned off. We also use analytics to ensure our website works in the best possible way to enhance your visit (user experience).